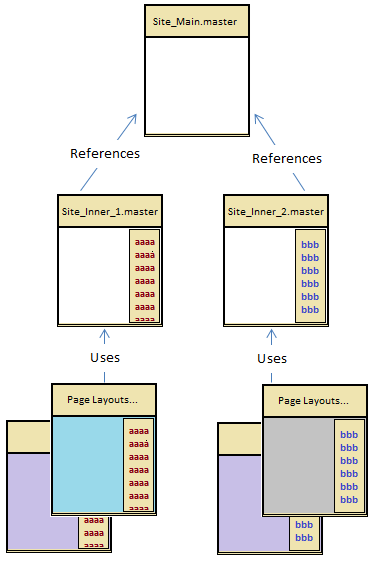 Master page inheritance is useful in SharePoint sites where we need multiple master pages with the same global layout structure. For instance a SharePoint site with all sub-sites having a unique right column for each sib-site can use master page inheritance. Here one option is to copy the entire HTML into all the master pages, but it is not a good option if we want to modify something. Following example promotes the reuse of the right column content within a site. Parent Master Page (Site_Main.master)Site_Main.master is the base master page and it represents the main master page area. Site_Main.master contains the header/ footer content and three Content Place Holders for main content. Inherited Master Page (Site_Inner_x.master)Site_Inner_x.master represents the subsite master page area for a specific subsite. Subsite specific right hand side content is populated in these master pages. Here the main thing to notice is the MasterPageFile value, which is the actual reference to the base masterpage. PlaceHolderMain, PlaceHolderPageTitleInTitleArea and PlaceHolderPageDescription content areas will be overridden in page layouts. But RightWebPartArea will not be overridden in page layouts.